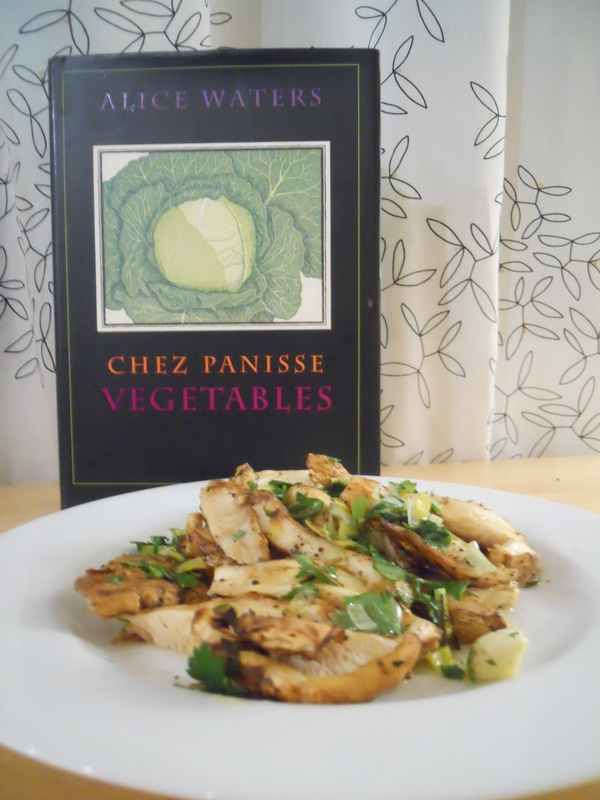 This cookbook is another Alice Waters must have. It will come in especially handy next year, I imagine, as I prepare to shift this website over to my new project. New project, you wonder. In an effort to expand my culinary horizons, each week in 2011, I will cook whatever arrives in our CSA box. I have loved cooking page 210 from every cookbook I own. I admit it, I like the surprise each week, but I don’t want to just go to page 211 in 2011. In part because many of the recipes I cooked on page 210 extend onto page 211. Instead, come January, I am going to cook whatever shows up on my doorstep in our weekly CSA box. Even if it's eight pounds of Napa Cabbage. That has happened. More about this project at the end of this year. I am not quite done with the Page 210 project, and I don't want to get too far ahead of myself here. I still have two more cookbooks (I realize this brings me to 53 cookbooks, but I started during a half week, and I want to finish out the year). Boar, people. I am making boar (if we can find it). Stay tuned. Anyway, I imagine when I am cooking my way through the box, I will want to call on the divine Ms. W. for inspirational ways to cook what's local and seasonal. She is the queen bee of this kind of cooking. Cèpes are simply porcinis, which are hard to find right now in the grocery stores. 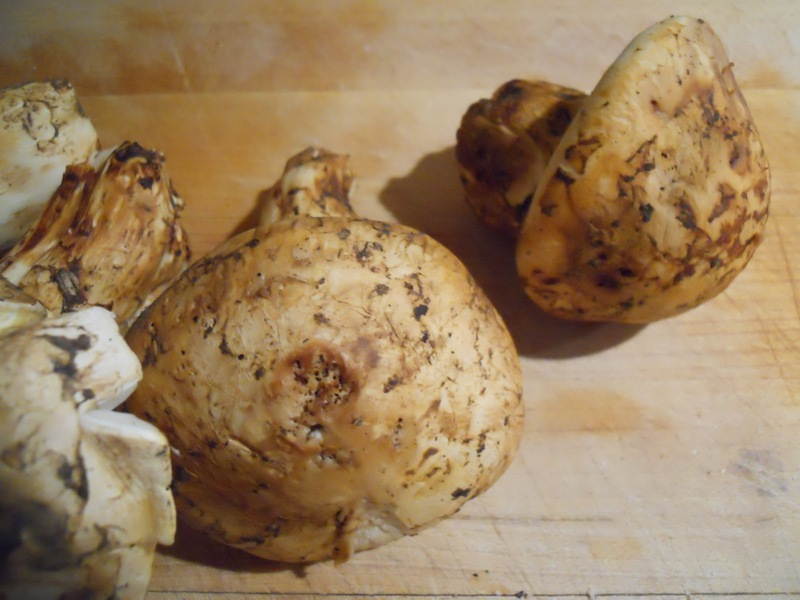 However, given the amount of rain that we have had, we do have an abundance of other fantastic wild mushrooms, so we trundled on over to the Monterey Market and picked up some mushrooms. I expect my mycologist friends to identify these. Go ahead. In the mean time, here is a website to answer all your burning questions about cèpes. But let's get down to business with this recipe. It's December, and we live in California. So we grilled. Yes, it was pitch black at 6 p.m., but there we were, flashlight in hand and mushrooms on the grill. And it was pretty grand. 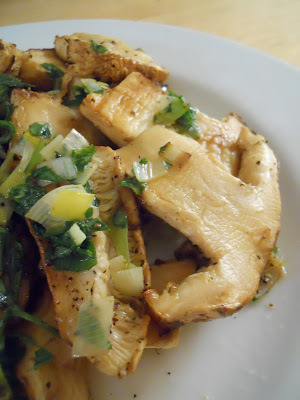 I actually have very little to say about this simple recipe except that you should do this, any time of the year (use your broiler if grilling is not an option right now--and with the ten days of rain forecasted for us, I am glad we got the grilling done earlier this week) and with any type of large, firm mushroom. 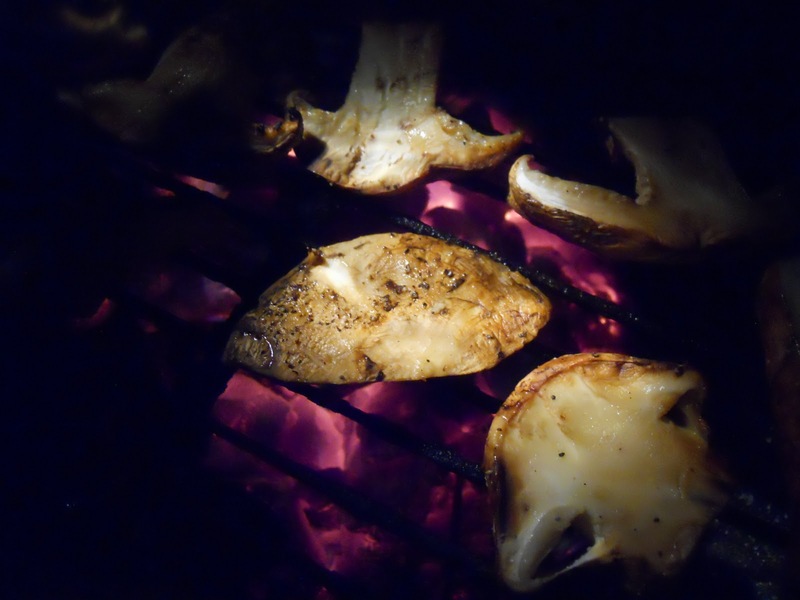 The mushrooms we had were very woodsy (it was like licking a pine forest floor) and the smoke from the grill made this absolutely fantastic. 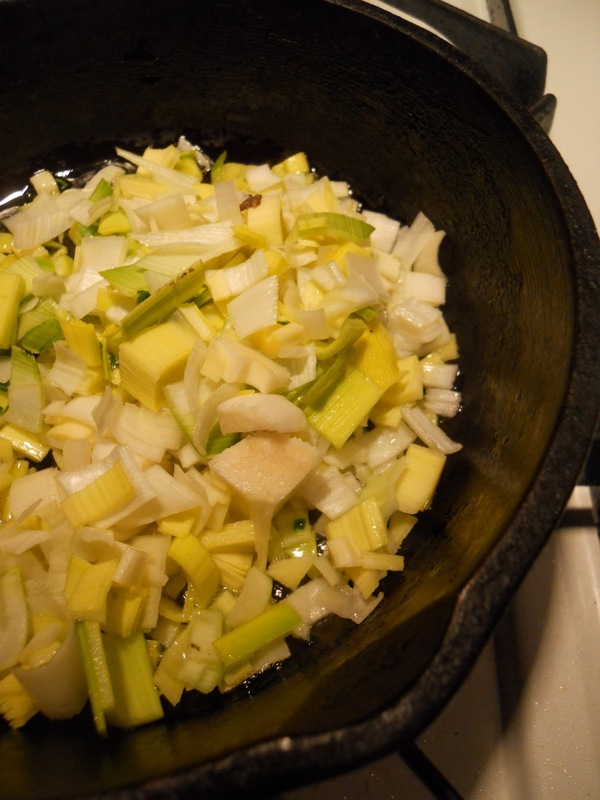 I was out of shallots, so I used leeks which I quickly sauteed first, and they were darned delightful. We squeezed some lemon on top, which brightened up the savoriness of the leeks and parsley. In sum, yum. Make these next time you need a simple side dish. 1. Trim fresh mushrooms, cutting away any dirt or pine needles embedded at the base, and brush or wipe the caps and stems clean. Cut them into 1/4-inch-thick slices. Brush them with the olive oil and season with salt and pepper on both sides. 2. Chop parsley leaves and shallots and mix them together. 3. 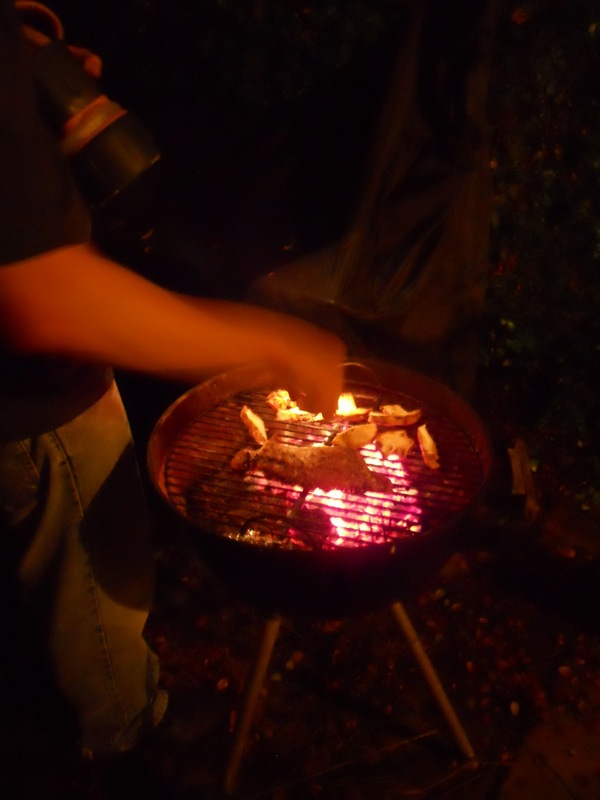 Grill the mushrooms over a low fire for about 4 minutes on each side. They should be golden brown and softened through. Arrange the mushrooms on a warm platter. Squeeze lemon juice over them, sprinkle with the parsley and shallot mixture, drizzle generously with olive oil, and serve. Or omit the parsley and shallots and serve the grilled mushrooms on a bed of arugula leaves.